Hopefully 2009 will be the year I finally BUILD this panel that has been evolving for so long now! I bought an OKI C5650 colour printer last year, which can print out this panel at full scale onto a single 216x900mm sheet of banner paper - very handy for getting a feel of how it'll all work and look. I've moved the air-vents off the panel and plan to attach these directly to the NACA inlets on the fuselage side-panels. I've also moved the MGL Voyager EFIS left of centre which gives some more room for the radio and transponder, as well as putting it in better reach of my left (non-stick) hand. I'm going to use the Aeroconversions standard throttle quadrant, so the throttle & mixture knobs have been removed from this panel also. The knobs on the far left & right brackets are for carb heat & cabin heat. Switches: Mags/Start; Master ALT & BAT; EFIS, Radios, Autopilot-Servos; Nav/Strobe Lights, Fuel Pump & Smoke. I will have to lower the panel support cross member to accommodate the Voyager EFIS and at the same time I plan to hinge the panel to the support for easy rear-panel access. It's starting to look like an all MGL panel now. I'd like to squeeze in an MGL Voyager EFIS, which does basically everything (including driving the autopilot servos), along with an MGL VHF COM radio and transponder if it is available. MGL rock! This panel image was made with X-Panel 5000. Note: All panel graphics below here were created with a simple, free web application at www.epanelbuilder.com. Unfortunately the free version has been removed and replaced by a not-at-all-free flash-based application, which I don't like at all. I've changed my mind from wanting to dual-sticks to a centre-stick. So the throttle is now definitely on the left, and the Primary Flight Display goes in the centre of the panel, for when I sit in the middle, flying solo. And I just like the GRT Horizon too much to not have it. I'll just have to save up for it! Although, Dynon have just released a large-screen version of their EFIS now, also... but it's not available on the panelbuilder site yet. And I can't decide where to put the radios now! Also realised that there is a row of rivets along the bottom edge of the panel, so it's not possible to put instruments and switches etc. there. I'm thinking of a full-width sub-panel for the engine controls and switches. Starting (finally) to get realistic about the cost of all this stuff, I really couldn't pass up the value of the Stratomaster instrument that is now the de-facto standard in Sonex aircraft. It really is very good value for money, and includes VFR flight instruments and engine monitoring functions. But, it only has a black & white display, and there is no AH. I was obviously having trouble deciding where I wanted the throttle, so I put in two of them! Stratomaster Ultra-X (ALT, IAS, VSI, TAS, Density ALT, Air Temp, + heaps more); Magnetic Compass; G-Meter. XCOM760 VHF radio,MicroAir T2000SFL transponder, Anywhere Map with an iPAQ & GPS system. The XCOM radio is similar to the MicroAir M760 VHF radio but with a VOX intercom, standby frequency monitoring and more power, among other features. Like the MicroAir, it is Australian designed and built. Stratomaster Ultra-X (RPM, Oil-Temp, Oil-Pressure, 6xCHT, 2xEGT, Voltage etc.). Next the GRT EFIS Horizon-1 came onto the scene. Quite a bit more expensive then the Dynon EFIS-D10, but a lot more functionality and with a larger display. I want one! This panel shows two, along with the GRT Engine Information System, and an expensive GPS/COM radio. I lower cost MicroAir transponder however. Still, no way on earth could I afford this. In fact I soon realised that I couldn't really afford/justify the Mustang-II at all, financially or time-wise. Then Dynon released details of their EFIS-D10, and an M-II panel template became available on epanelbuilder. Retrospectively, I was getting a little carried away with these panels, but it's a lot of fun playing around on the panel builder site! But I was trying to minimise instruments to some degree. This panel concept used the RMI MicroEncoder and MicroMonitor, the Dynon EFIS, UPS radios and PDAs for moving maps. The M-II can have a main fuselage tank and up to 4 additional wing tanks. A lot of fuel! that big brown quad-guage in the centre is a 4-way fuel gauge. When I first start thinking about instrument panels I was building a Mustang-II. At that time www.epanelbuilder.com didn't have an M-II panel template, so I used an RV-6 panel to get a feel for how things might lay out. There weren't any affordable glass-cockpit instruments in 2001, apart from the Sierra Flight Systems (now Chelton) EFIS-SV, which did and still does cost a fortune! Man, this panel looks HEAVY! 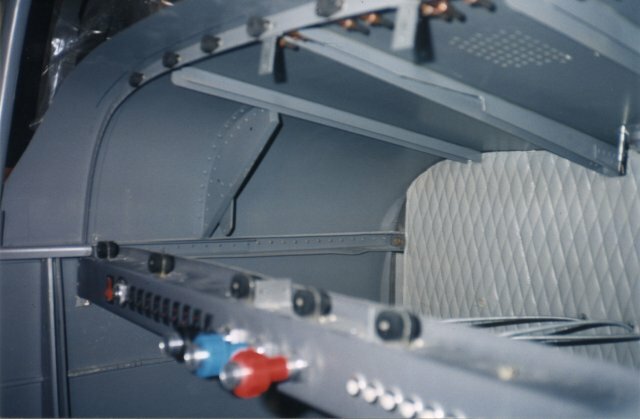 The picture below shows a "removable panel" modification to a Mustang-II. I like the sub-panel cross-member with switches and controls. I think there is enough leg room in the Sonex for a similar kind of arrangement. Something to look into.